The first “awesome” indie writer John L Monk discovered was Lindy Moone, but I found her first. Among all authors I’ve met in real and online life, I judge Lindy as the most talented and most fearless. Did you get that? Editing, formatting, and illustrating–for charity. Plus Lindy selected the contributors, cajoled, critiqued, kept them laughing, and held them together to the finish. Net proceeds from the sale of this book will benefit Equality Now, an international charity that works for the protection and promotion of the human rights of women and girls. 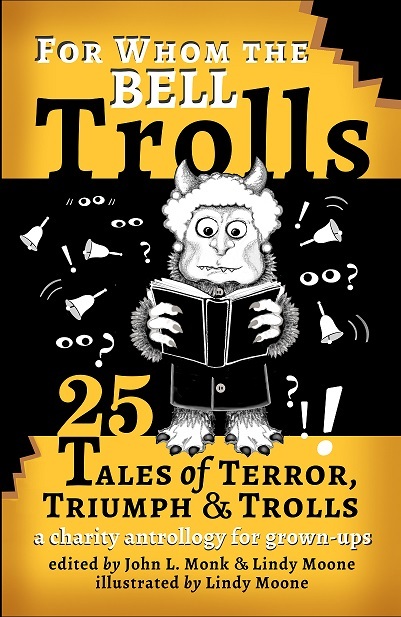 For Whom the Bell Trolls may be on sale by Christmas.You don’t have to create a reminder–I’ll let you know. You can count on Lindy’s writing to be unique, hilarious, irreverent, and a bit indecent. 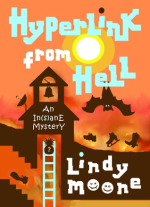 Hyperlink from Hell is a story within a story, on the outside a conventional mystery, but as crazy inside as most of the characters. I particularly like the print edition for its visual appeal. Both print and ebook are on sale at Amazon.com. Next: In “Indie Authors, Where Are They Now (Part three) I’ll update the work of John L. Monk’s other admirable indies: Mark Capell, P.T. Hylton, Harvey Click, Dan C. Rinnert, and finally, John L Monk (himself). Very cool! Looking forward to the anthology. I have an ARC of the anthology but I’m eager for the print edition with the illustrations. I’ve been on the sidelines of this project with no good story to contribute. Thanks for your comment. And she has no idea she’s fearless! What a great project. Thanks for letting us know, and I’ll look for the post about the release. Definitely want to support this cause.